when going over little bumps do you here the thing making a metel clanking noise? because there is alittle bit of lateral play with the floating brake " bar". i dident know if this was normal. hey dude....as a general rule...clanking = bad....on the other side: it`s normal for the floating brake thingy to move a BIT from side to side...if it clanks it must be hitting the frame at some point of the suspension movement..so try to bend the rod in a way it doesn t hit the frame...oh...and don t brake anything. I have one too. What you are hearing is the play in the rod ends. If they are relatively new, and not worn out, you can get rid of the noise by using chain lube on the ball. If they are old and worn, you'll need to replace them. Tightening the rod ends up won't get rid of the play, it only adjusts the length of the rod. i have a fly also, it is fairly normal for it to "clank" as it breaks in, see above post. It isn't hurting anything except your sanity, it really bugged me so I put zip-ties on both sides of the ball joints, it restricts the side to side movement of the arm ans the zip-ties serve as bumpers, it cut the noise down almost completely. hope that helps. 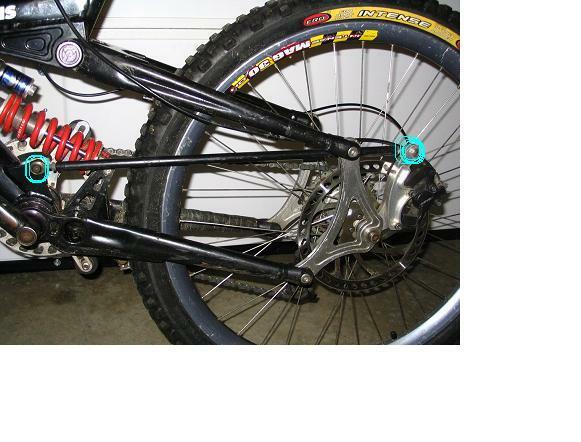 do you have a pic of the zip ties on the floating brake? do you think i can press the bolts and " bearings" out and get new ones? I saw you and the bike over at Diablo today. The 'clank' you hear on there is normal. It did it when I owned the bike too. It's from the rotation of the ball joint thru the travel. You can remove the joint and put some adhesive backed foam behind it where it contacts if you don't like the sound. You replace the rod ends as a unit. ska todd- where you the one with the morewood? i think your whole team has morewoods right? Nope...I was the guy on the jazz blue Sunday. There are a wide range of quality of rod ends available, from really cheap industrial quality, up to amazingly expensive rod ends used for aviation. The cheaper rod ends have a lot of play. 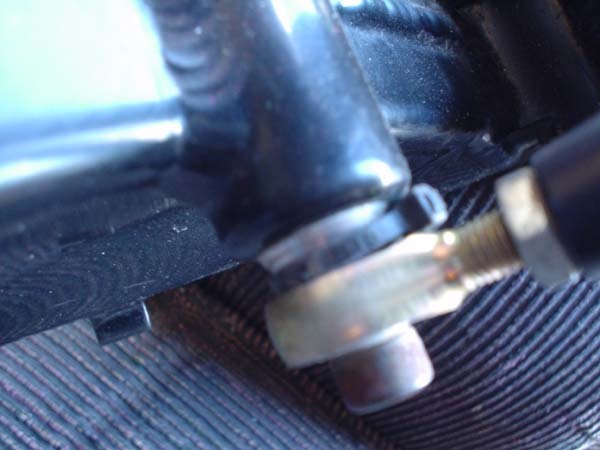 The aviation rod ends have almost no play but are probably to tight, so could prevent the floating brake working properly. It sounds like you bought the frame used so the rod ends might be worn. I used to race a formula car, and replacing rod ends was part of the annual maintenance. I'd start with contacting the frame manufacturer (or who ever made the floating brake) and buy a new set of rod ends. If the rod or arm is hitting the frame, fix that first. You can move the position of the rod by spacing the rod ends in or out using washers as spacers. Mars V's frame has been ridden hard by expert level New England DH guys for the past 4 seasons. I can almost guarantee it needs some love to stuff like bearings and those end joints. He probably can't get those end joints thru Profile as they only made a handful of those frames and a small number of them with floaters. The guy who worked on this project unfortunately passed away so finding someone at Profile with intimate knowledge of the project could be tough. 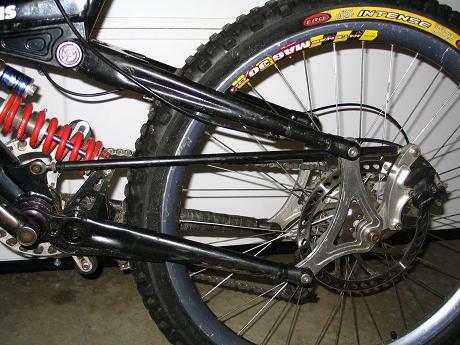 When I owned the bike there was no contact between the floater arm and any frame part. The end joint would rotate some and knock against the rear brake adapter. We just would pad up the contact area w/ some adhesive (like w/ a Shimano derailleur on an old M1). I'd bet that if he took the rod ends to a Formula race car shop, they could source them with no problem. Race cars eat rod ends. The other would be to contact Brian @ Brake Therapy as he makes and sells floating brake that look quite similar. He would have the suppliers to get the rod ends. If you have a Grainger store nearby they carry them. I think you can order them online too. It ins't pretty, but it works and it's cheap. I know Grainger carries them only because thats where I got mine. If you do a search on their site for"rod end" a whole bunch of them come up, but I am not sure if the size you need is up there. Other than there I would agree with everyone else just contact the manf. Good luck dude! Last edited by Fly; 05-23-2005 at 03:13 PM. www.mcmaster.com thats where i got my ball joints for my floater. Pretty cheap and good tolerances. a good way to get rid of the noise is to route the brake line along the rod instead of the swingarm. This keep the rod from flopping around and also gives you the optimal brake line routing. mine does that too. last time i went riding the noise was really starting to bug me in the stutter pumps. i think there was always a little play in the rod, even when it was new. anyway, thanks for posting this thread. i'm going to try the zip-tie trick and see if that helps.